Nearly 370 people made public comments. None support this policy change. Wisconsin Public Service Corporation (WPS), a utility based in Green Bay, proposed in May to further increase the mandatory fixed charge for electricity that each residential customer has to pay each month. 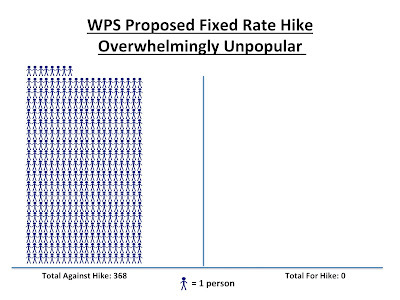 In 2014, WPS was approved by state regulators to raise this fee from $10.40 to $19, and they are now proposing to further hike the fee to $25 per month. In total, this represents a 140% increase in the monthly mandatory “fixed charge” that each customer would have to pay. Nearly 370 individuals spoke out against this proposal. Of significant note, not a single individual or organization who took the time to make a public comment is in support of these higher mandatory fees. Public comments were accepted online electronically, in paper format, and taken at a public hearing on September 9th in De Pere. 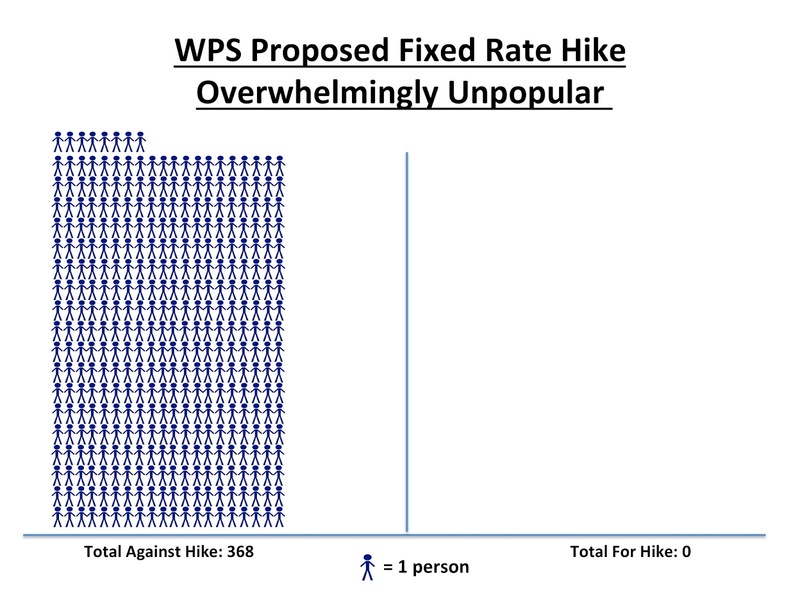 “It is clear that Wisconsinites overwhelmingly oppose WPS’ continued attempts to raise these mandatory fixed charges. These high fixed charges are a Robin Hood in reverse scheme: the lowest users of electricity end up paying substantially more, while high users of electricity get a windfall,” said Tyler Huebner, RENEW Wisconsin’s Executive Director. "I believe that we are paying enough. Period. I live and work in a rural area. Many of my students struggle for basic needs. How can you justify another raise in our rates? When is enough--enough? Analysis by RENEW Wisconsin shows Wisconsin is an outlier on this issue. 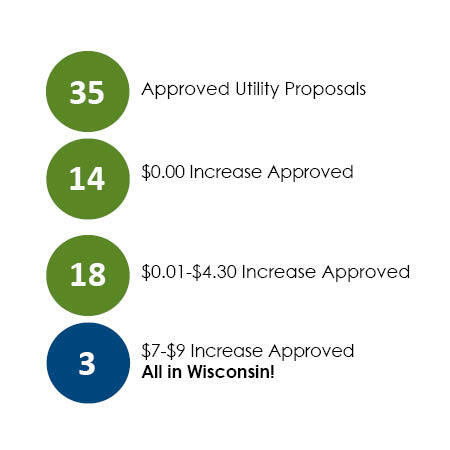 “Although 35 utilities across 19 different states have proposed increases in mandatory fixed fees in the past two years, only in Wisconsin have large hikes been granted. Fourteen utilities have been denied entirely, while eighteen have been granted small increases, from $0.10 to $4.30 a month for customers,” concluded RENEW’s Tyler Huebner. The graphic above depicts 35 investor-owned utilities which have requested increases to the monthly fixed charge each customer must pay in 2014 or 2015. 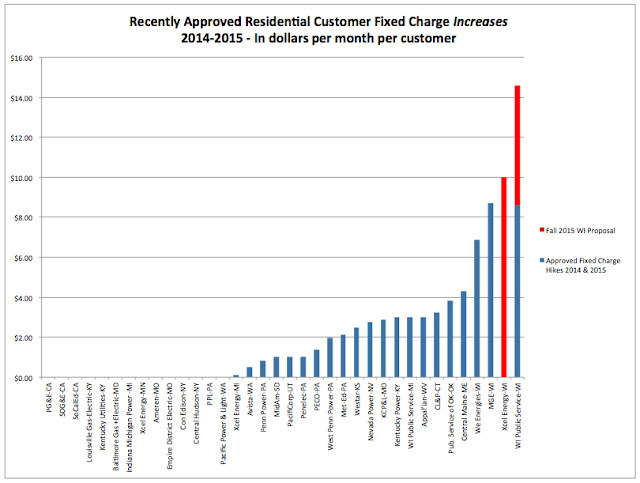 The 14 utilities on the left-hand side were completely denied their request to increase the charge. The middle 18 utilities were granted increases from $0.10 to $4.30 per month. To the right, the three largest blue bars, all for Wisconsin utilities, show higher fixed charge increases of $6/month and more. The two red bars depict 2015 proposals from Wisconsin utilities.